Environment and Climate Change Canada in associaton with the Lake of the Woods Water Sustainability Foundation will be holding a public information session in Kenora on the science underway to address toxic and nuicance algae blooms on Lake of the Woods. The session will include a series of posters on the program and ECCC scientists and staff will be present to answer questions. The session will also include information and staff from our partners at the Ontario Ministry of the Environment and Climate Change and as well as information from our partners at the Minnesota Pollution Control Agency. Please join us Monday August 14, from 10 am to 3 pm at the Clarion Lakeside Inn, Kenora Ontario. 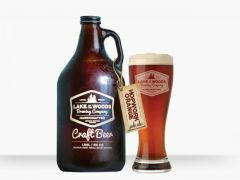 A Growler sized thank you to the team at the Lake of the Woods Brewing Co for its generous support of the Lake of the Woods Water Sustainability Foundation during 2016. We are honoured to have been one of five charities supported by the LOWBREWCO Charity Pints Program. When science and policy begin to converge, we're on the right track. 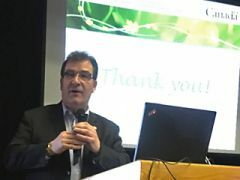 In addition to research studies, this year's science Forum highlighted policy efforts underway to put a binational plan in place for the Lake of the Woods basin, with presentations from Global Affairs Canada and the Rt. Honourable Robert Nault, Member of Parliament for Kenora, and a video address by U.S. Senator Al Franken.